Since its inception, the superhero genre has been the playground of the male power fantasy. With their extraordinary abilities, superheroes exert control in an uncontrollable world. They function outside the law and society, beholden only to an honor code they impose upon themselves. Instead of being limited by their tragic backstories, they rise above them and seek to right the wrongs the villains of the world committed against them. The men are handsome and muscular, the women beautiful and scantily clad. 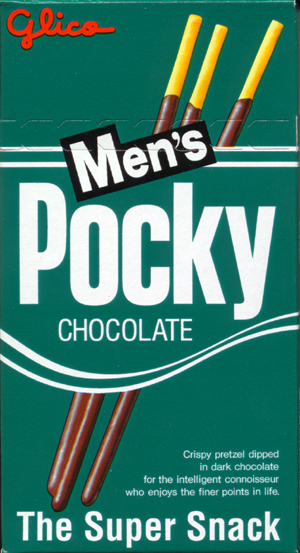 They are, in short, the ultimate in masculinity. 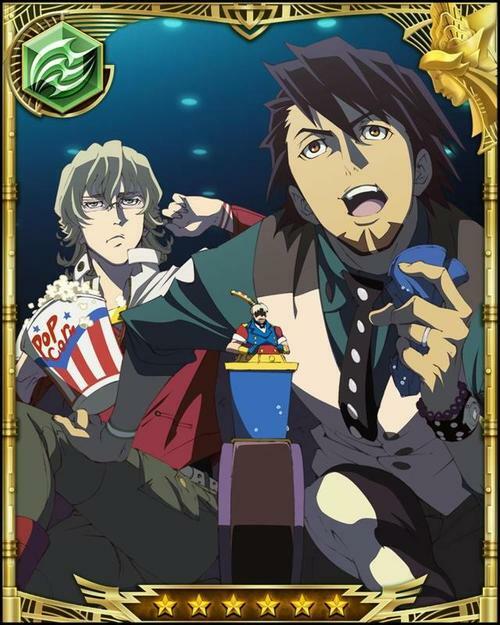 Tiger and Bunny draws upon these tropes in the story of Kotetsu Kaburagi, an aging superhero struggling to stay relevant. Through an involuntary and initially contentious partnership with the young, handsome, and brooding Barnaby Brooks Jr, Kotetsu manages to revitalize his career. When his powers start to fade at the peak of the team’s popularity, Tiger and Bunny examines what can happen when the powerful begin to feel powerless. By setting Kotetsu up in contrast with his idol Mr. Legend’s decline into alcoholism and abuse, the show skirts on the edge of making a statement about the fragility of masculinity, but in the end falls just short of being subversive. Kotetsu defines himself by his job, despite having a distinctly un-superheroic personality. He awakened to his powers at a young age, wreaking havoc on everything and everyone around him. He learns to fear his powers until a fateful encounter with Mr. Legend, the first superhero, who encouraged him to learn to control them and use them to protect people. Since that day, everything in his life has revolved around his heroism: a high school rivalry led him to his best friend and fellow hero, Antonio “Rock Bison” Lopez, and the woman he married and had a daughter with was a girl he rescued, also in high school. This job, however, has also robbed him of many important moments in his life: he missed his dying wife’s last moments when he was called away from her on a mission, and his daughter Kaede resents him because of his unreliability and absence from her life, caused by his unpredictable schedule. When the massive collateral damage caused by his snap decisions and reliance on instinct force his sponsor out of business, he chafes under the demands of his new corporate sponsor, which include his partnership with Barnaby, his polar opposite, and a hi-tech new suit to replace his outdated old Golden Age spandex. “This costume defines my life. It represents everything I am as a hero: A symbol of hope and justice…” he says, until his new designer interrupts him by calling it a “crapsuit”. Despite his attachment to the role, he is ill-suited to the structure superheroics has taken: a televised spectacle where the corporate-sponsored heroes must compete for points and popularity. Kotetsu relies primarily on emotion and instinct, determined to do the right thing but loathe to use his powers to actually hurt anyone. He is very much the modern conception of a “dad”: dumb jokes, bad dancing, well-meaning but clueless and a little bumbling, but coming through when it counts. His idealism and humanistic approach to fighting crime are as outdated as his outfit in this cold reality television competition. He seems like he would be more at home as a family man, caring for his daughter and aging mother, but he can’t let go. He’s sacrificed too much. It’s too integral to his self-conceptualization. Kotetsu shares much in common with his hero, Mr. Legend: both were heroes and family men, with wives and children. They espoused the old-school ideals of protecting and saving people, rather than defeating villains or fame and fortune. Both had connected their superpowers and careers to their self-image and masculinity. Finally, and most poignantly, both began to lose their powers in middle age. It’s not really a coincidence – Kotetsu modeled much of his career after Mr. Legend. The biggest difference, however, is how they reacted to their fading powers. 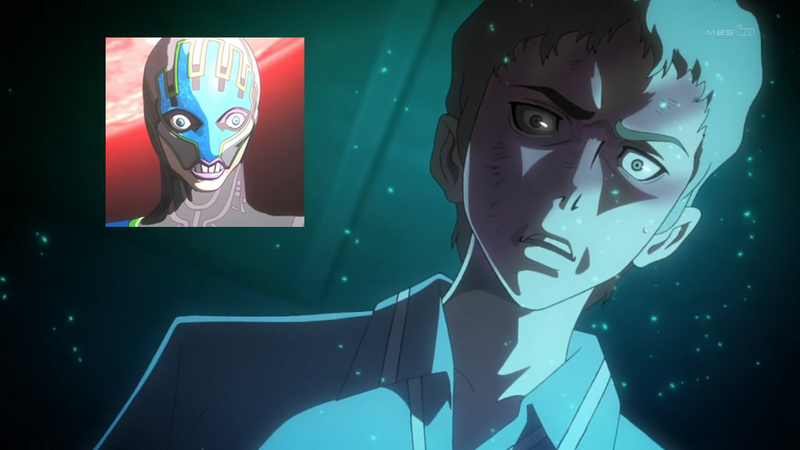 This is the point where Tiger and Bunny sets up the clearest, most obvious connection between superpowers and virility – virility referring not necessarily to fertility but “any of a wide range of masculine characteristics viewed positively”, per Wikipedia, including physical strength, charisma, and, yes, sexual prowess. Mr Legend, the man Kotetsu worships, tries to hold on to his power and fame. As Ben, Kotetsu’s friend and former employer, reveals, HeroTV would stage arrests and give Mr. Legend credit for the work of other heroes to hide his degenerating powers. But even his colleagues at HeroTV did not know the full effect of his posturing and how far it went beyond simple vanity. Past the mask, at home the patriarch of the Petrov family turned to alcoholism and abused his wife and teenage son. Men who feel emasculated and turn violent against those under their care is a common form of abuse, especially with men who work in hyper masculine environments such as law enforcement. Boys grow up being told, “be a man.” When those markers of manhood start to disappear with age and its accompanying drop in testosterone – things like physical strength, sexual potency, and earning potential – only one thing is left: physical aggression against people who can’t effectively fight back. Petrov’s downfall came when his son, Yuri, came into his own powers and immolated him with blue-hot flames. Yuri in turn would become Lunatic, a vigilante working in opposition to HeroTV who prefers killing criminals on the spot to arresting them. Mr. Legend, as the first superhero, was the apex of masculinity, a quality that became toxic the moment it was threatened. Kotetsu’s initial reaction to his powers degenerating are similar to Petrov’s: frightened and alone, he struggles to conceal it and takes to visiting bars more frequently. However, Kotetsu differs from Petrov in some crucial ways. Petrov was the sole hero for most of his career. The name “Legend” was well-chosen and reminiscent of Superman in its simplicity. Kotetsu, one of several competing heroes, hasn’t been on top of the heap for some time. The slow loss of his powers prompts a trip home to Oriental Town to reconnect with his mother, older brother, and ten-year-old daughter Kaede. The visit to his childhood home allows him to reconnect not only to his family, who know him as the goofy, clumsy younger Kaburagi brother, but to himself and who he was before his self-worth came to be defined by his powers and career. Oriental Town looks exactly like many rural Japanese towns, designed to create a sense of nostalgia and homeliness in Japanese viewers. It is in this time Kotetsu faces not only the loss of his powers but his estrangement from Kaede, who resents him for his absence in her life and his inability to follow through on his promises due to work. She is unaware of his superhero identity and, rather than a symbol of masculine, patriarchal power, sees him as a flaky workaholic who can’t even make it to her figure skating recital in his own town. With the physical distance between the two eliminated, the emotional distance stands starkly out to Kotetsu, who struggles to comprehend that the attitudinal not-quite-teenaged girl in front of him is no longer the sweet four-year-old he left with his mother to raise six years ago. At the end of the visit, they manage to reconcile, and Kaede awakens to her own NEXT powers right as Kotetsu returns to Sternbild City. This time, he promises, he’ll be back soon – all he needs is enough time to resign and announce his retirement. Kotetsu’s decision is where the series skirts on the edge of subversion. By accepting the loss of his powers and choosing to return home and care for his family, he is effectively feminized. His identity has so long been hung up on his powers and his masculine role as a Heroic Protector, and his disappearing powers echo his fading career at the start of the show. However, where he once struggled against that loss of the trappings of masculinity – the power and influence and self-imposed role as protector of the weak – he chooses to just let it go. In choosing to retire to the domestic sphere to care for his growing daughter and aging mother, his powers and career no longer define him, and gender roles no longer hold such sway over his life. This is not, of course, to say that domesticity and submissiveness are inherently feminine, but they are traits that have been imposed on women, who historically have been forced into a domestic role with little say in the course of their lives. In choosing domesticity, Kotetsu is able to regain much of what his career robbed him of: namely, his relationships with his family and the contentment that is carried with it. As I said before, Kotetsu feels more like a family man by nature, but his decision to be a hero kept him from realizing that part of himself. This plot direction is subversive – gender roles are so deeply ingrained that many men fear emasculation above all else. We live in a world where Brogurt, Broga, and Men’s Pudding exist, simply because yogurt, yoga, and pudding have been primarily marketed toward women and thus are untouchable for men. Kotetsu, with his superpowers and the fame and money that they bring him, possesses the ultimate male power fantasy… and he chooses to walk away from it in favor of being a stay-at-home dad in a small town. It’s a choice few would make, or even find acceptable. Were it more acceptable a choice for men to make, rather than considered effeminate and thus inconceivable, how many men would be free to take on such a role and find greater satisfaction? 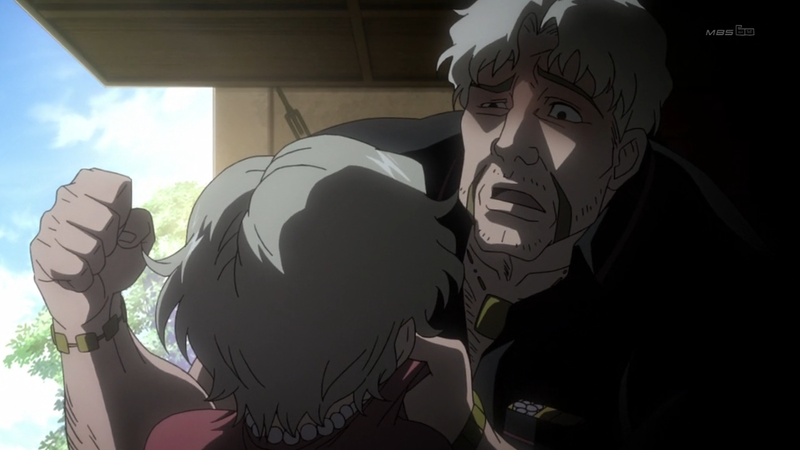 That connection to his family saves him and his colleagues when Kaede, newly awakened to her NEXT powers, travels to Sternbild City to rescue her father. This relationship plays on the parallels between Kotetsu and Legend, underlining the importance of Kotetsu’s choice. Petrov, unable to accept his power’s degeneration, destroys his once-close family by turning to violence and dies from the powers of his adolescent son. 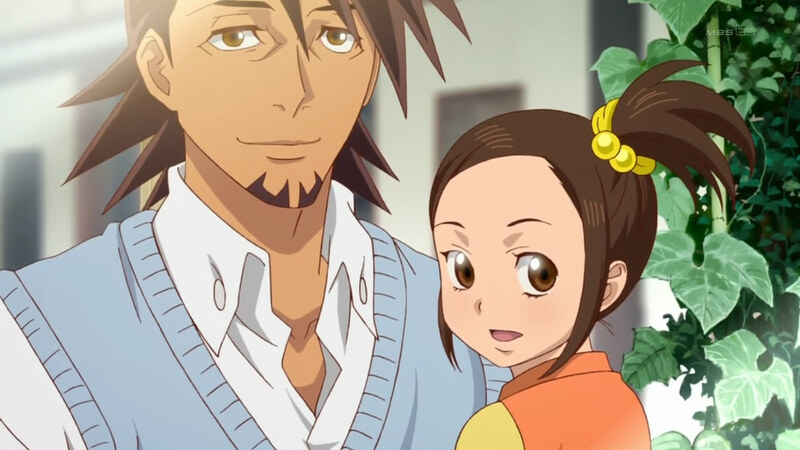 Kotetsu, by accepting his fate, reforges his bond with his daughter, who uses her own powers to protect him. What’s more, her power is mimicry: she takes on the abilities of the last NEXT to touch her, symbolizing her newfound respect for and desire to emulate her father, whose identity she has just learned. It’s a powerful statement about the destructive nature of what society builds up as manhood and deems mandatory and the nurturing potential of abandoning that framework in favor of the traditionally feminine. Unfortunately, the epilogue undermines the show’s message and spoils its subversive nature. Both Kotetsu and Barnaby announce their retirement after the show’s climax, as both their personal arcs have ended and they have found closure on their respective issues. 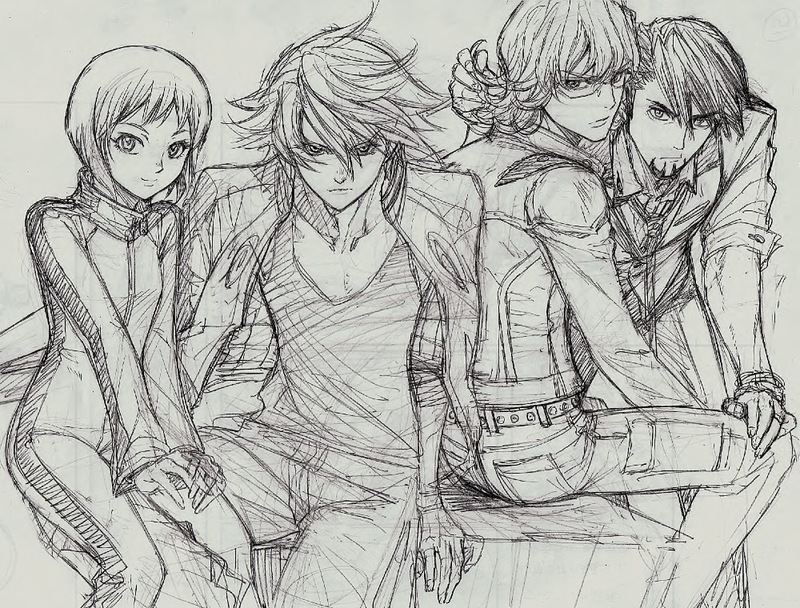 The show leaps forward a year, to HeroTV broadcasting its six heroes; Kotetsu and Barnaby are conspicuously absent. But then the camera switches over to the “Second League”, a group of NEXTs who fight petty crime with less impressive powers, such as the ability to shoot their fingernails or have one hand able to get really big. Among the members of the Second League is Kotetsu, who has rebranded himself as “Wild Tiger One Minute”, as his powers now only last one minute. He corners the perpetrator on top of a building, but with his Hundred Power already used up, he falls through the glass ceiling and into Barnaby’s waiting arms. As the two talk – still with Barnaby holding Kotetsu – he reveals, “Kaede thought it was really uncool that I was just being a couch potato all day. And you know what I realized? You don’t always get to set your own limits with the choices you make. So, that’s that. Even if I lose all my powers, I’m still going to keep on trying. And even if I look ridiculous, I’ll remain a hero till the very end. When you think about it, it doesn’t hurt to have a hero who’s uncool, right?” I found this ending to be, frankly, disappointing, as it pulls the potentially subversive threads back into a more traditional narrative. Kotetsu referring to himself as a couch potato indicates that rather than adopting the position of caretaker, he left his elderly mother to continue to do the work of running the house. Instead of allowing her to enjoy her own retirement, Kotetsu apparently became an overgrown child himself, reinforcing rather than subverting the stereotype that men are useless in the private sphere. His return to his role as Wild Tiger was no doubt intended on the part of the creators to leave things open for a sequel, but that doesn’t change or excuse the damage to the show’s themes. 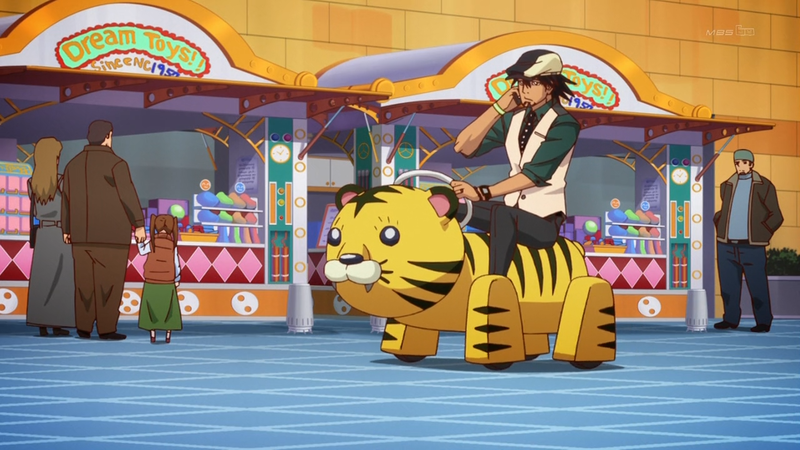 Rather than finding closure and peace, like Odysseus back home in Ithaca, Kotetsu remains trapped in limbo between mandated masculinity and its slow disappearance, between forced retirement and being a laughingstock – issues that surface once again in Tiger and Bunny: The Rising. 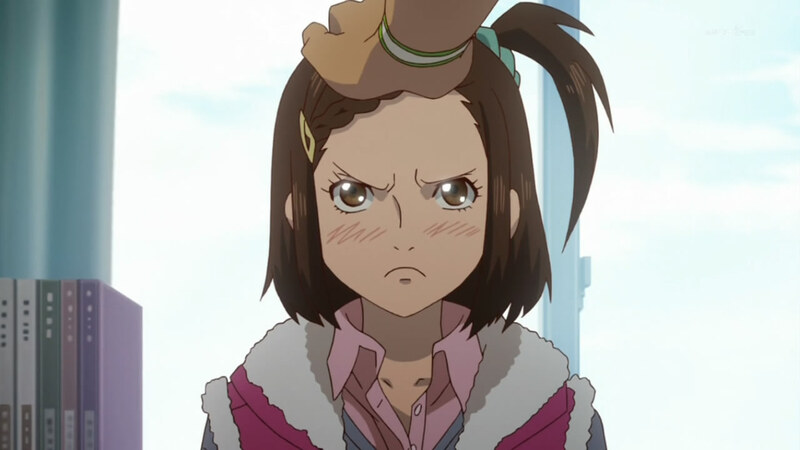 Tiger and Bunny tells, for the most part, an extremely well-crafted story. It makes excellent use of parallelism in story and characterization, both subtle and overt, and makes use of the mythic nature of the modern superhero narrative. That cleverness makes its missteps all the more frustrating as it compromises its own messages through cynical cash grabs and appeals to the lowest common denominator.